The design consists of a custom machined aluminum housing to incorporate all the optical components. 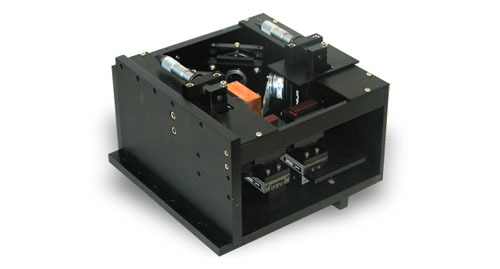 The optics consist of a 50/50 beam splitter and additional 45 degree mirror. The (2) split beams will be directed through (2) individual shutter blades and then to (2) individual 1.0" dia focus lenses. (Includes (2) SIU-100 Shutter Interface Units). Each focus lens will have independent micrometer head focus adjustments. The unit is designed to keep the focused beams as close to each other as possible. Individual nozzles are included. The housing is designed to be as compact and light weight as possible. The focus positions are adjustable with respect to each other via micrometer head with 25mm travel. Cartridge loaded optic cartridges. Open and Closed proximity switch reporting on both shutters. System designed for 12mm beam diameter. Includes 532nm optics. Shutter blades will incorporate 532nm wavelength mirrors.